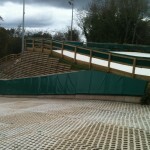 Sports Safety Padding – Ski Club of Ireland. 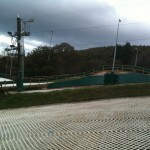 The Ski Club of Ireland, based in Kilternan, South County Dublin is responsible for the promotion & development of skiing and snowboarding in Ireland. 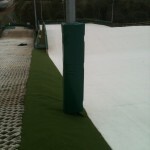 Fitness Functions manufactured, supplied and installed the high impact padding for the Ski Club of Ireland’s 130 meter and nursery slopes. 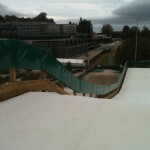 This type of padding will assist, redirect and protect any wayward skiers or snowboarders. The specialist padding was finished in an easily cleaned vinyl covering while also taking into account weather-proof requirements. We project managed all works relating to this specialist padding and under a tight time schedule. Over the last few months they have significantly added to their facilities assisted by the Sports Council of Ireland. Approximately €1.5m has been invested in the site, these new facilities have been open to the public since the 6th November. Sports post padding – Basketball, rugby/goal posts & wall padding. Column or pillar padding – for bike sheds and covered areas. Edge padding – for projecting brick work, corners of buildings. Fence post padding – for protection where fencing is near to sports courts. 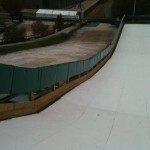 End wall padding – for the end, or side, wall of your sports hall where run off areas are limited.